When I was a little girl, the Sears & Roebuck Christmas catalogue came every October. That’s how I knew Christmas was getting close. It was a shiny, red, magical book, with Christmas tree lights, maybe a rosy-cheeked Santa, and little boys and girls in warm PJs on the cover. I’d sit on the couch and turn the pages through this “wish book” and dream of all the toys, from sleds and ice skates and bicycles and dolls—all sizes, all kinds—and doll wardrobe cases and dress-up cowboy and Indian outfits. There were microscopes, rock polishing kits, toy pianos, teddy bears, and train sets. There was much to pick from. On Christmas morning, at barely light, the living room would be full of toys under the tree. Its red, blue, green, and yellow lights made all the presents sparkle and shine. My little sister and I, awakened by our father, barely had our eyes open, were shy at first, just standing there and looking at all Santa brought. Oh! It was a wonderland of new perfect and pristine toys! My daddy would dive right in, laughing and picking up each toy, playing with it first. He had more fun than we did. I remember a blue bicycle the year I was seven. One Christmas, we got a merry-go-round. A pogo stick was one of my favorites. We got dolls—lots of dolls. There was the Bannister Baby, the Madame Alexander, the 36-inch doll, Chatty Cathy, and then the Barbies came along. There were pop beads, jewelry boxes (I still have mine! ), pearls, roller skates, and boxed games. In our stockings were candy canes, chocolate Christmas candies, and oranges. To this day, when I see a lighted Christmas tree, I still remember those long ago Christmas mornings in my little house on Deering Street, with my mama and daddy and sister, and I still get that funny-happy feeling in my tummy. When I got a little older, my daddy told me that when he was a little boy growing up on the family farm at Hardy Hill in Kemper County, Mississippi, all he got for Christmas every year was a toy wooden car, a handful of firecrackers, and a couple of oranges. My daddy and mama grew up during the Great Depression in the 1930s, when people didn’t have any money, some didn’t have any food, and they certainly couldn’t afford Christmas presents. Dad seemed happy, though, remembering what he got. I could picture those bright-colored oranges down in his soft red-felt stocking hanging from the fireplace mantel. Maybe oranges were rare and special back then, and it was a treat to get one, all sweet and juicy and colorful. So I carried forward the tradition. When I grew up and had two little boys, I always put an orange in their stockings. I wonder now if my daddy’s parents, my grandma and grandpa, were so old that they were close to the old traditions and grew up with legends that I didn’t know about. Once upon a time in a faraway land, there was a man named Nicholas, born in a village on the Mediterranean seashore in the country we now call Turkey, 270 years after Jesus lived not too far away. Nicholas inherited a large sum of money, but spent his life giving it away to help the poor and the persecuted, and eventually became a bishop in the Christian church and a saint. One day Saint Nicholas heard the villagers talking about a poor, widowed man who had three beautiful daughters but was having a tough time making ends meet. The father worried that he wouldn’t be able to find suitors, or husbands, for his daughters because he didn’t have money for a dowry. It was a custom in days of old for girls to give money, called a dowry, to their husbands upon their marriages. Saint Nicholas wanted to help, but he imagined the man might be too proud to accept charity. One night, he went to their house, climbed up on the roof, and tossed three bags of gold down the chimney while the family was sleeping. One of the bags of round gold coins landed in the toe of a stocking that was hanging from the mantel. The girls had washed their stockings and hung them up by the fire to dry. When the family awakened in the morning, they found the gold, including the bag in the sock which had turned into a ball overnight—a shiny bright golden ball. Because of Saint Nicholas’s generosity, the daughters were now eligible to wed, and their father was happy. So, Hardy and Jillie, the bright-colored oranges your great grandfather, your grandmother, and your father got in their little-boy-and-girl stockings were a symbol of the shiny bright gold left by Saint Nicholas in those long-ago stockings hanging by the fire. Giving the orange is a way to celebrate generosity and caring for others, without thinking about a gift in return. Today, maybe there’s a lesson for you. If you get an orange in your stocking, remember Saint Nick, the poor father, and the three beautiful girls. Remember the gold. Believe. Believe in the random kindness of others. And believe enough to let yourself be moved to show kindness to those in need. Give a hug to your grandma; give a kiss to your mama and daddy; give a smile and nice word to your friends. When you share the sections of an orange with someone, you are sharing the gift of you, sharing what you have and giving from your heart. For giving is the true Christmas spirit. I shared this on Facebook because I thought it was powerful. This is someone else’s story – not mine – but in 7th grade, I would have never spoken up at all. Would you have? Would you now? Everybody I know has basically told me to shut up. Some of them hate what is happening in our country and are hurting and disturbed, too. Some are loving it. Some just plain have no clue and are happy to have a new Savior that can heal everything from a headache to lack of a job. Some just vote for the R Party no matter who’s running. I keep telling them that I can’t be quiet and I can’t not say anything if I see something distressing. Something wrong. Something completely against the Bible I grew up with and the teachings of my parents and church and school. Something that makes a mockery of the way I raised my children and the stands I took as a classroom teacher. I believe SILENCE IS ACCEPTANCE. One little thing happens. One lie is told. You sit back and let it go. Another lie, another ill-meant action, and you turn your head and pretend not to see. Another and another. It becomes easy to slide into a pattern of silence, of closing your eyes, of ignoring wrongs, of taking the position, “It doesn’t do any good to say anything.” It becomes easy to just smile and sit back and let your character melt at your feet. I read Anne Frank’s diary several times in junior high and high school. Every time I read it, I thought: How could people let this happen? How could they hate this one group known as Jews? How could the rantings of one madman lead to so much destruction and death, when there are so many good people out there? I also thought: This kind of thing could never happen in my country. I’ve climbed those narrow steps behind the swinging bookcase up to the secret annex in Anne Frank’s house in Amsterdam. I looked out the window at a tall church steeple nearby. I refuse to go back again to a place created by hate, fear, and silence, so near to God. Sometimes you come upon priceless little treasures you tucked away years ago for safekeeping. And you find them later and melt like chocolate on a warm spring day. It happened to me last week, a week before Valentine’s Day. I was cleaning out some boxes and bins in an upstairs closet, organizing and throwing the old out. In a folder I found a card Charlie had made for me one February 14. I think it was the same Valentines he bought a life-sized card, three feet tall, and so how do you top that with something personal? You draw a card. You make it yourself. And so the engineer drew a heart with a red magic marker. Note that the low point at the top of the heart where the lines meet is exactly above the bottom meeting point. Because that’s what engineers do. And note that the sides are exact, too. I’m sure he folded it or something to get it right. Because that’s what engineers do. It can’t be off. And I don’t know if there’s a compass thingy for a Valentine. The always-working engineer found time to make a heart. I can’t tell you how many hundreds of times I practiced signing his name. He always laughed and told me I’d never be able to do it like him. And he was right. He cut out the heart. Lord help us all, the engineer did not stay on the line! Charlie’s “I Love You” came to me ten, maybe fifteen years ago, inside this red heart. And it was endearing to know that a busy man would take the time to create something so simple, so personal, so heartfelt, rather than just stopping by the Hallmark store. I didn’t know then that it would be a heart – his own real heart – that would take him away from me. But it was, and he is gone, and now I have this paper heart and the two red lines that touch in the middles and the magic words inside. And for the moment it is enough. I set the clocks forward last night before I went to bed, all except the clock in the bedroom, which I never changed last fall when we were supposed to fall back an hour. So now, it’s right. Just as now, the world is right because it’s warming up after a brutal winter, the most brutal I can ever remember in my long, long life. Plants in my yard that are supposed to make it through the cold months are burned brown. 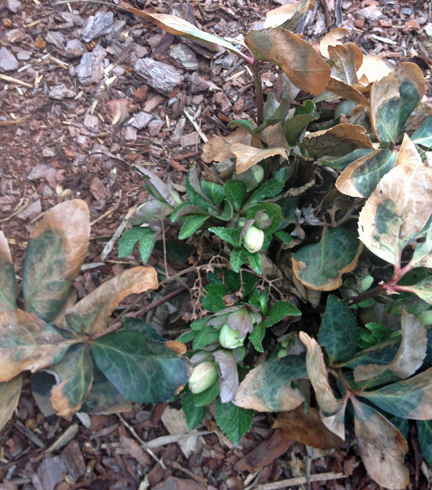 The lenten rose, for example. It sits in wet dirt with scattered and faded mulch around it left over from a year ago, and its leaves are dried and toasted . . . and yet there are new fresh blooms, winter white, tender, vulnerable. I feel like that, too. As the world grows ever toward the newness of spring, I feel a surge in my spirit. I cleaned up my deck yesterday. My favorite things to do this time of year are: eat breakfast on the deck, eat lunch on the deck, eat supper on the deck, build a fire in the chimenea on the deck, read on the deck, take my laptop outside and work on the deck, sit on the deck and look at the yard and figure what else I can plant out there, look at the Medicine Wheel herb garden and feel a need to go out there when the sun is warm enough and refresh it to look like the first chapter of my book, Remember the Dragonflies. As the world grows ever toward the newness of spring, I want to get my pink fingernails in the dirt. I want to plant tomatoes. I want to plant more vegetables, berries, and flowers. I want to plant. Period. I want to spring forward in the newness of spring. This is the big weekend! The book’s debut! 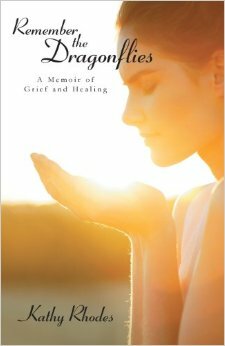 I have two signing events for Remember the Dragonflies: A Memoir of Grief and Healing. Friends and local writer colleagues, please come say hello! They are both come-and-go events; just stop in, shake my hand, look at my book, buy it if you want, or buy something else, or buy nothing. I’d just love to have your warm friendly smile and your presence and your support! Tonight — Nov. 22, Barnes and Noble Cool Springs, 5:30-6:30, as part of Discovery Friday. Tomorrow — Nov. 23, Brentwood Library, 10:00-3:00, as part of the annual Author Fair, 8109 Concord Road in Brentwood. I hope to see you there on this, the weekend before Thanksgiving. I am grateful to be able to share my journey with you and to share a bit about the man who was my husband. What does a girl do when she’s had a blog for six years and now she has a hard time being regular with it? Well, she gets another blog. It’s kinda not working out so well yet, but I hope to change that. So in the coming days, if you see I’m still not doing well with it, drop me an email and tell me to get my act together. I don’t mind at all. I hope to do one or two posts a week on my blogs — this one and rememberthedragonflies.wordpress.com. Come follow! Come push me along! Come and criticize. I don’t mind.